Round Small Amber Canister Set W/COPPER FDL LIDS LARGE SIZE CANISTER- 4.25" R.. Round Small Amber Canister Set W/SILVER GRAPE LIDS LARGE SIZE CANISTER- 4.25".. Round Small Amber Canister Set W/SILVER DOME LIDS LARGE SIZE CANISTER- 4.25" ROUND.. 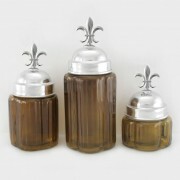 Round Small Amber Canister Set W/ SIL FDL LIDS. LARGE SIZE CANISTER- 4.25" ROUND x.. Round Small Amber Canister Set W/SILVER FLAT LIDS LARGE SIZE CANISTER- 4.25" ROUND.. Round Small Ocean Blue Canister Set W/COPPER FDL LIDS LARGE SIZE CANISTER- 4.25" R.. Round Small / Ocean Blue Canister Set W/SIL FLAT LID LARGE SIZE CANISTER- 4.25" ROUND x 7.25" .. Round Small / Ocean Blue Canister Set W/SIL GRAPE LARGE SIZE CANISTER- 4.25" ROUND x 10" HEIGH.. Round Small / Ocean Blue Canister Set W/SIL DOME LARGE SIZE CANISTER- 4.25" ROUND x 9" HEIGHT .. Round Small / Ocean Blue Canister Set W/SIL FDL .. 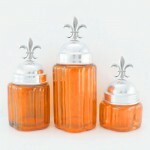 Round Small / ORANGE Canister Set / Set of 3 with Top . .. Round Small / Purple Canister Set / Set of 3 with Top . ..